After subcutaneous or intramuscular application, the drug, through its warhead, docks specifically onto local CD32 (FcgammaRII) expressing cells such as monocytes and monocyte-derived dendritic cells (mDCs) as well as plasmacytoid dendritic cells (pDCs) (figure/step1). 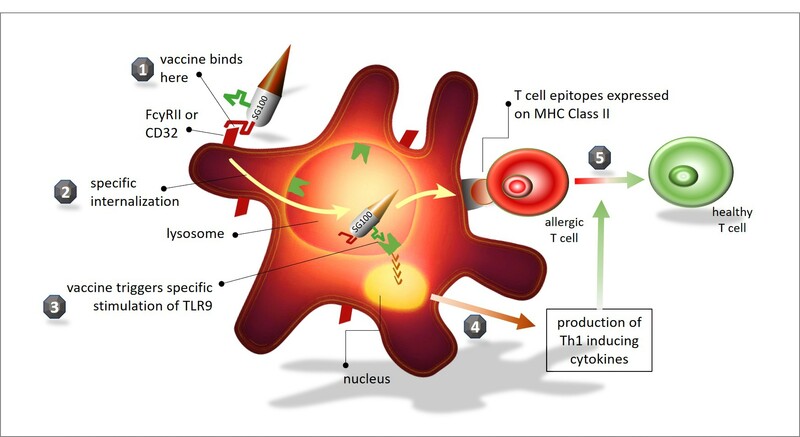 Binding to CD32 triggers internalization of the vaccine into endo/lysosomes (figure/step2) which in pDCs leads to specific activation of Toll Like Receptor 9 ( TLR9) (figure/step3), and in mDCs as well as pDCs leads to enhanced antigen presentation of the T cell epitopes in the immunogen. Both types of DCs act together in remodelling the “allergic” Th2 response into a “healthy” Th1 response: pDCs produce large amounts of Interferon alpha (IFN-alpha) after TLR9 stimulation (figure/step4); IFN-alpha directly stimulates the production ofTh1 cells and in addition prompts mDCs to produce large amounts of interleukin 12 (IL -12); IL -12 is the major Th1 cell inducing cytokine. Under influence of the IFN-alpha and IL -12 allergic, HDM specific “allergic” Th2 cells are remodelled into “healthy” Th1 cells, triggering normal immune response to future natural HDM exposure (figure/step5).